Favorite SFT Moments: I can't be brief, so I won't try. Related Work: Training Director for the Ruckus Society, Campaigns Coordinator for the International Campaign for Tibet, and Program Association for the International Accountability Project. Favorite SFT Moments: Attending the 1st SFT National Conference - energy, excitement, the newness of the movement, talking with other SFT members all night about Tibet, and what our visions were for the movement. Oh, and hanging a banner across from the Chinese embassy before Clinton's trip to China. I was a member of UW Madison SFT from 2003-2005. I learned a lot from SFT sector trainings and from the other SFT members around me. I learned how to work as a member of a small tight-knit team and learned how all the project roles - fundraising, media, messaging - fit together. My best memory of my time in UW Madison SFT was planning a number of events devoted to getting Tenzin Delek Rinpoche's death sentence changed. Everyone in SFT Madison and Madison's Amnesty chapter worked so hard on keeping the momentum going and the energy positive. Knowing that we were making an impact locally as part of a worldwide campaign was so motivating. It was also great to be able to announce to our supporters that Rinpoche's death sentence was successfully commuted. 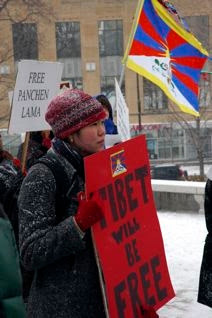 It helped illustrate to new supporters that we could effect change in Tibet from Madison, WI.